Standard Grade Revision Writing Exam. Looking at the Criteria Any piece of writing is marked on the following areas: Expression and Style. Content/Ideas. 2 Looking at the Criteria Any piece of writing is marked on the following areas: Expression and Style. Content/Ideas and Relevance. Structure, Paragraphing and technical accuracy. Intelligibility! 3 Important Advice Always write the task number in the margin. Only choose and attempt one task. Relevance – make sure that your piece of writing is closely linked to the question you have chosen. Aim to plan – bullet point or mind-map. Spend at least 5 minutes at the end proof reading – check your punctuation and spelling. 4 So what does this mean? 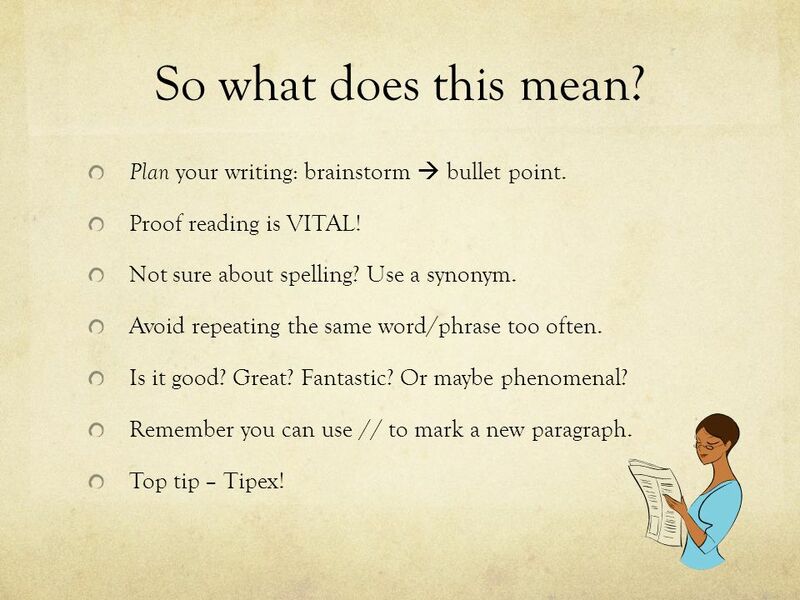 Plan your writing: brainstorm  bullet point. Proof reading is VITAL! Not sure about spelling? Use a synonym. Avoid repeating the same word/phrase too often. Is it good? Great? Fantastic? Or maybe phenomenal? Remember you can use // to mark a new paragraph. Top tip – Tipex! 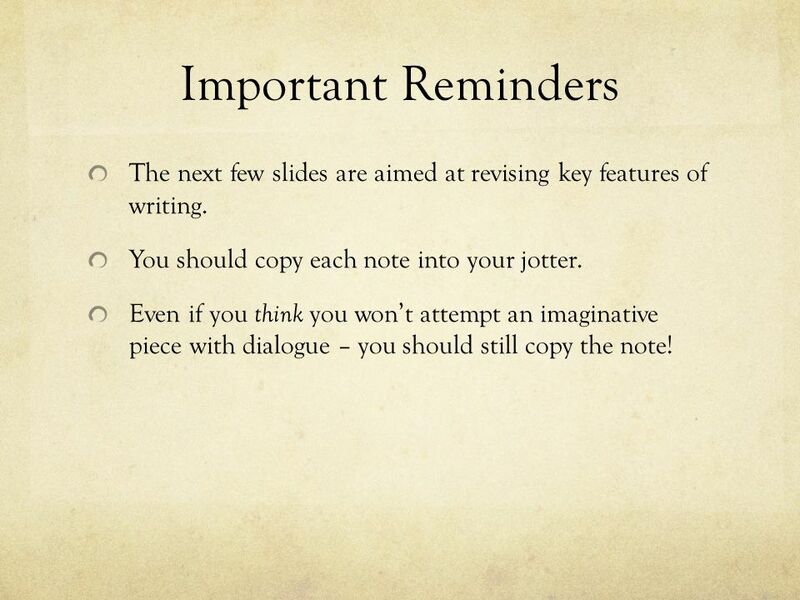 5 Important Reminders The next few slides are aimed at revising key features of writing. You should copy each note into your jotter. 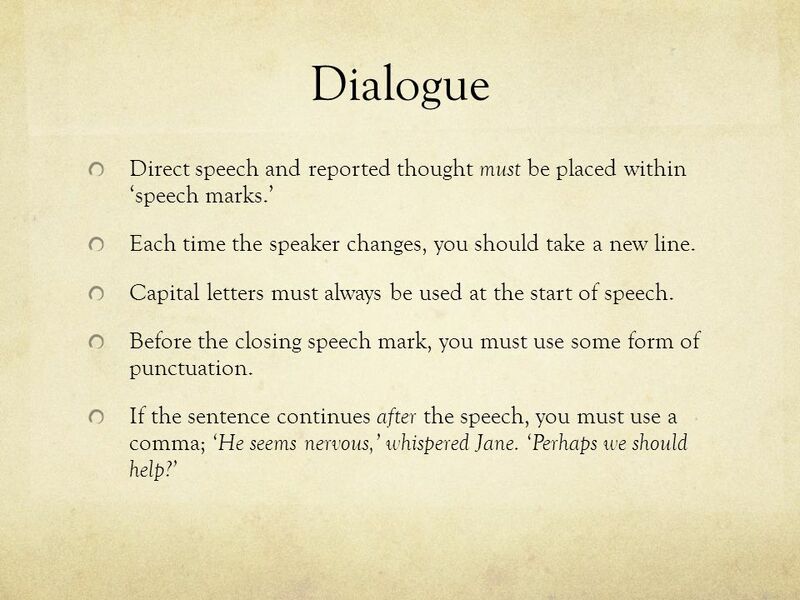 Even if you think you won’t attempt an imaginative piece with dialogue – you should still copy the note! 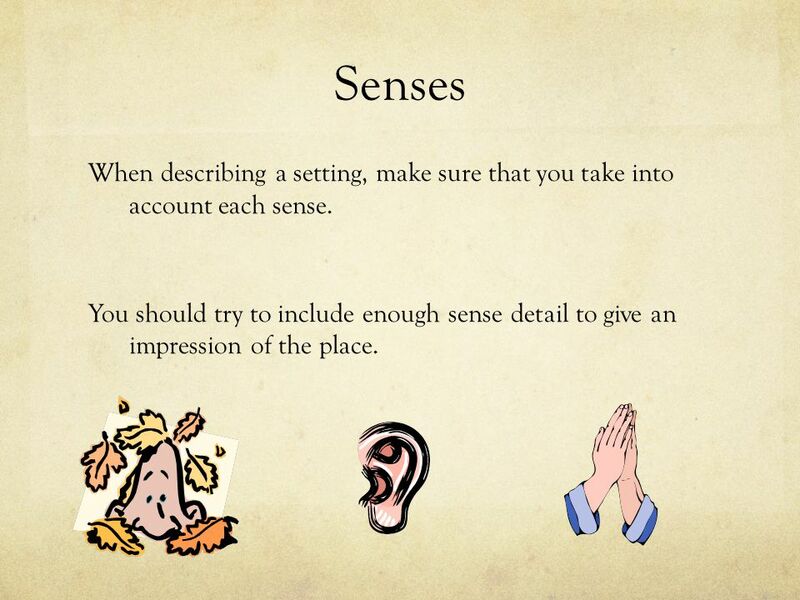 9 Senses When describing a setting, make sure that you take into account each sense. You should try to include enough sense detail to give an impression of the place. 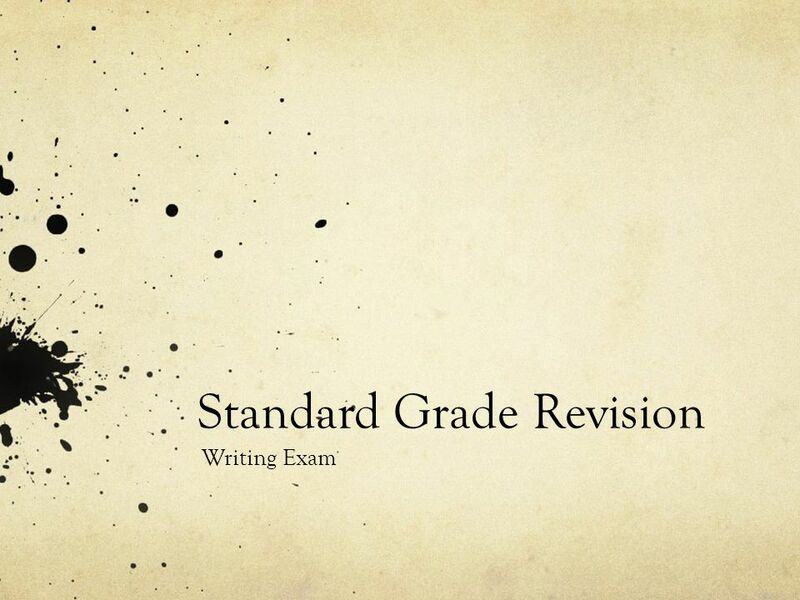 Download ppt "Standard Grade Revision Writing Exam. 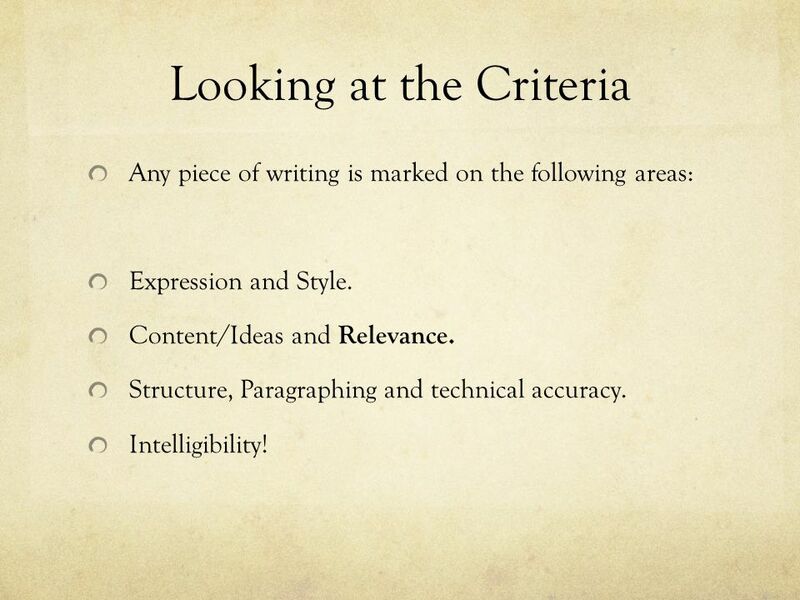 Looking at the Criteria Any piece of writing is marked on the following areas: Expression and Style. Content/Ideas." Close Reading A revision guide to question types. The Writing Paper The key to doing well is attention to detail. I can write at Level 1. I can write at Level 2 I can write at Level 3 AF5 –change the types of sentences I use. 1. I use simple sentences and can begin. Strategies for Writers Grade 2 © Zaner-Bloser, Inc. All Rights Reserved. Peer Conferencing Peer conferencing is talking about your writing with a partner. The Writing Process Communication Arts. Or… How to earn brownie points with your professors. Copyright Narrative Writing Paper: English 1, Section B, Question 2. 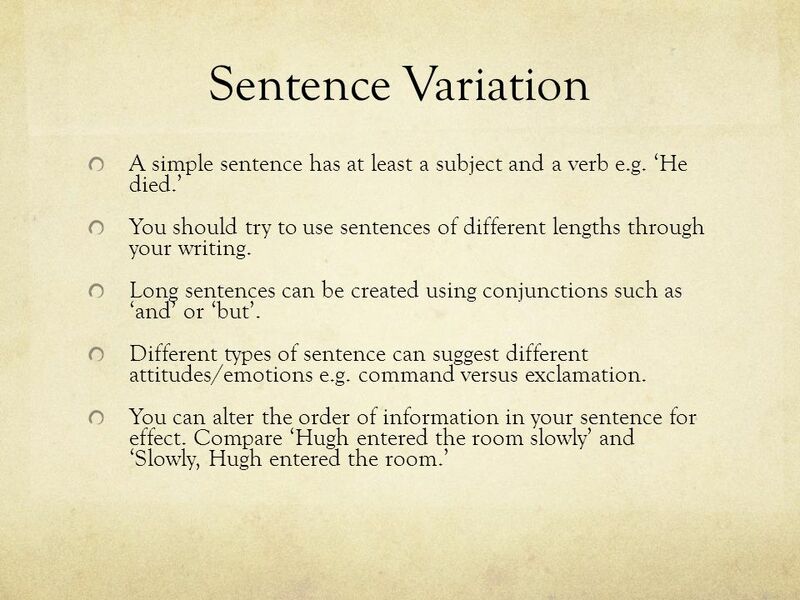 SENTENCE TYPES: Simple, compound and complex. WHAT MAKES A SENTENCE NEEDS THREE THINGS… 1 The words make sense and express a complete thought. 2 It begins. an hour and a half There is an hour and a half for this paper, which means that, allowing for: reading the questions, making your selection, writing the. 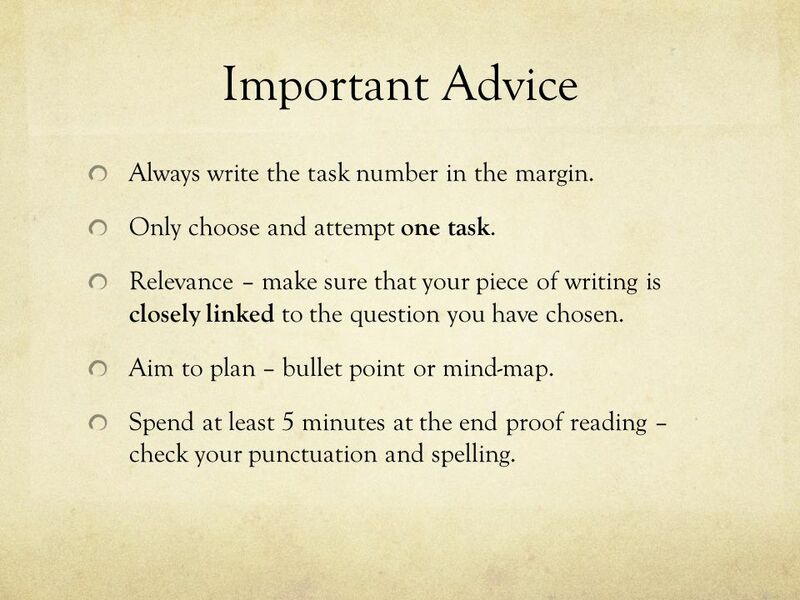 Revise Wise Study Shelley College Advice, Support & Revision Ideas To Make YOU a SUCCESS. Teaching the Productive Skills “When you want to convert someone to your view, you go over to where he is standing, take him by the hand (mentally. Fourth Grade Grammar Jeopardy Start. Starter: Vary your sentences How many types can you name? 1.Simple 2.Compound 3.Complex 4.Minor 5.Questions, especially rhetorical 6.Rule of three. For. Procedural Writing Writing a How-To Paper. 10 top tips to manage your essay Start early Find out marking criteria Understand the question Organise your thoughts, ideas and information Create outline. 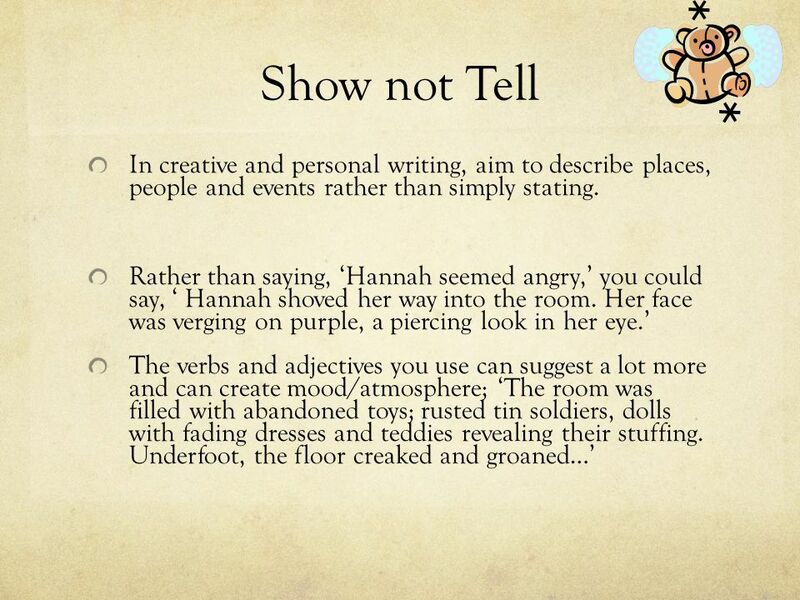 Narrative Essay: Telling your Story. Simply a Story Oral stories (what we did over the last weekend) Can come from your experiences, imagination, or a.
Module Code CT1H01NI: Study Skills For Communication Technology Lecture for Week 2 2014-2015 Autumn.